The arrival of pre-monsoon rains in southern Bangladesh has revealed an alarming level of risks for Rohingya refugees, United Nations humanitarian agencies said on Friday, warning that they do not have the funds needed to protect hundreds of thousands of desperate people once the rainy season begins in earnest. 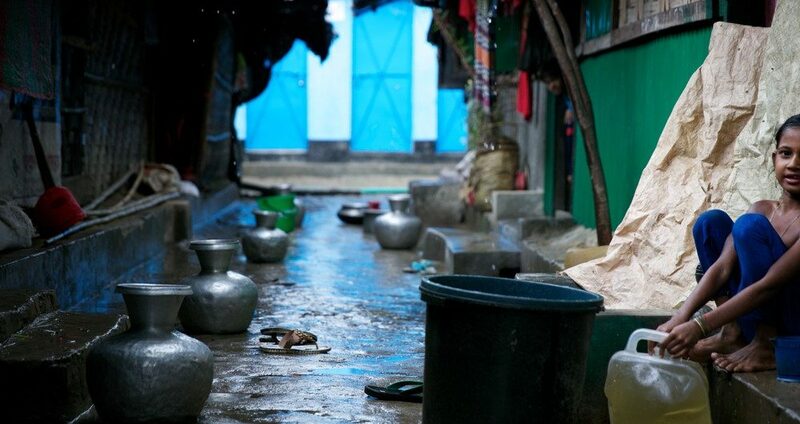 “The arrival of the rains marks the start of what is going to be an incredibly challenging period for the refugees and those working to support them,” said John McCue, an official at the UN International Organization for Migration (IOM), in Cox’s Bazar, where more than 700,000 refugees are living in overcrowded camps. UN agencies and their partners have some heavy machinery and road clearing equipment, with more are expected to arrive. But humanitarian workers are facing severe shortage when it comes to other vital resources. To date, just seven per cent of the UN migration agency’s $182 million appeal for 2018 has been secured. “The grim reality is that most [refugees] are living under tarpaulins on highly unstable ground and are going to have to survive months of rain, floods, landslides and possible cyclones. They are in desperate need of support and protection and we simply do not have the funding we need to deliver a fraction of what is required,” said Mr. McCue. Furthermore, the sheer scale of the crisis and the short period of time in which it unfolded has had a major impact on the topography of the area. Trees and vegetation had to be cleared to set up shelters and as a result, it is now impossible to predict where the most severe weather-related damage will occur, officials say. Conservative estimates suggest 120,000 people will be at grave risk from flooding and landslides when monsoon proper hits. However, one thing is certain: protecting almost a million people from the life-threatening dangers of cyclones and other disasters far exceeds current financial resources and pledges. In spite of the severe funding shortage, IOM and partners on the ground, including the UN World Food Programme (WFP) and the Office of the UN High Commissioner for Refugees (UNHCR) are working flat out to prepare. IOM is setting up sites across the camps stocked with emergency supplies to ensure that even if areas are temporarily cut off, people will still have access to aid. Teams of porters have also been readied to bring in supplies on foot, if roads are damaged. UN agencies are also supporting the relocation of thousands of families from areas deemed most at risk and helping communities strengthen their resilience. They are also training refugees in first aid, search and rescue, and early warning systems as part of a cyclone preparedness programme.